Luis Enrique Camejo graduated from the Provincial School of Art in Pinar del Río (1986), the National School of Arts in Havana (1990), and the Superior Institute of Art in Havana (1996). From 1996 to 2007 he was a Professor of Painting at the Superior Institute of Art. Notable solo exhibitions include Emptiness (11th Havana Biennial, La Cabaña Fortress, Havana, Cuba, 2012); From Havana to Beirut (South Border Gallery, Beirut, Lebanon, 2009); Seasons (Villa Manuela Gallery, Havana, Cuba, 2009); Vanishing (with Pablo Soria, Pan American Art Projects, Miami, Florida, 2008); Mobile City (Godoy World Art Gallery, Madrid, Spain, 2007); Dreams (9th Havana Biennial, Cuba, 2006); Places (Servando Gallery, Havana, Cuba, 2005); Traffic (Livingstone Gallery, The Hague, Netherlands, 2005); and After the Rain (Gallery 106, Austin, Texas, USA, 2002). He has also exhibited at important events and institutions such as AD HOD Gallery in Ontario, Canada; the Intemporel Gallery in Paris, France; the Triennale Bovisa in Milan, Italy; Arteaméricas at Miami Beach Convention Center in Miami, USA; Balelatina in Basel, Switzerland; the Corcoran Gallery of Art in Washington DC, USA; the Art Fair Köln in Cologne, Germany; and The Toronto International Art Fair in Toronto, Canada, among others. He received the First Prize at the 5th Nicomedes García Gómez Painting Contest in Segovia, Spain, 2003. 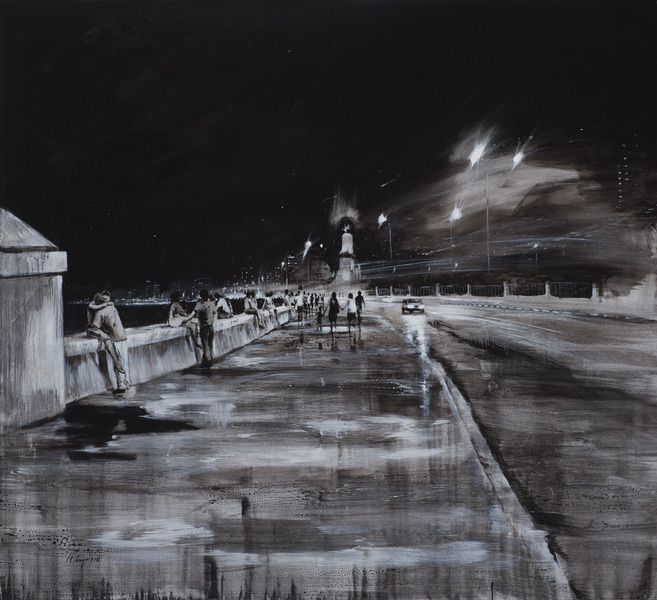 Sin título, de la serie Malecón (Untitled, from the series Malecon), 2012. Acrylic on canvas. 71 x 77 3/4 in. New York, de la serie Ciudades (New York, from the series Cities), 2014. Acrylic on linen. 78 1/2 x 78 1/2 in. New York, de la serie Ciudades (New York, from the series Cities), 2012. Acrylic on linen. 78 1/2 x 70 1/2 in.